This pendant has unforgettable look. The imagination draws all the power and monumental beauty of the water while looking at it. The pendant It is made in the technique of hot vitreous enamel baked at high temperature. It&apos;s possible to make it in emerald colour or without blackening. 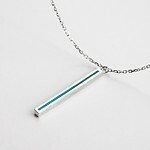 You can order a chain or a cord to the pendant in Chains section.